A majority of politicians who responded to a Cycling in Dublin survey said they wanted bicycles to be allowed on Luas outside of rush hour. 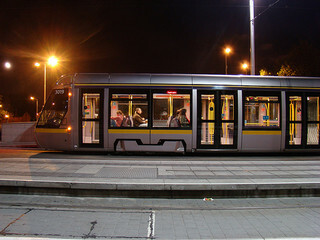 A total of 76% (45) said they would support bikes on Luas “off-peak or when it’s not busy.” Just 15% (9) were unsupportive of the idea and the final 8.5% were neutral on the issue. Last year the Railway Procurement Agency officially banned bicycles on-board trams after years of relying on an informal operational ban. The RPA claims there are safety issues with bikes on Luas, however similar services around the world allow bicycles to be carried on-board. Cyclists have been allowed to take bicycles on Irish Rail Dart and Commuter services outside of rush hour since 2011. The permitted times are: 10:00 to 15:30 and after 19:00 Monday to Friday and all day Saturday and Sunday. Irish Rail says restrictions apply at certain times including major sporting events and concerts. Folding bicycles when covered are allowed on Luas and Irish Rail at all times. Originally published in the Summer 2013 edition of the Cycling in Dublin newspaper, which can be viewed or downloaded here. This story is based on a survey for the newspaper, the full results of which were published here.